Mailer`s Precancel Postmark (MPP A) Sm. Mailer's Postmark Permit Cancel is made for years of trouble-free service from real rubber. Laser engraved for sharp, crisp impressions on your philatelic creations. 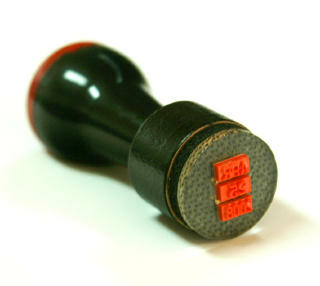 Producing the finest rubber stamps for your mailings are our primary concern! Undoubtedly the most popular of ALL our MPP designs! This Mailer's Postmark stamp design is slightly smaller in size to better fit any piece of mail. Impression won't overpower size A2 envelopes and postcards. Rubber die is closely cropped to reduce halo-ing. with thick foam cushion - easy to place, easy on the fingers. Use ANY color ink pad (sold separately). Deluxe Model - You may also order this MPP rubber stamp mounted on wood, hour-glass shaped ART mount molding. stamp and the mount -- meaning less chance for errant ink smudges. Art mount molding is laser indexed, too! NOTE: This MPP design is also available in a PRE-INKED MODEL (See Postmark section of our web site). 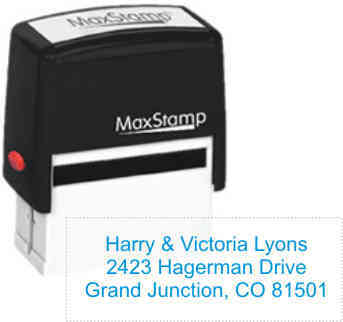 HERE'S A HELPFUL TIP - WHILE YOU CAN USE ANY TYPE OF INK WITH THIS HANDSTAMP, WE HIGHLY RECOMMEND StazOn INKS. WITH AQUEOUS COATINGS. DRIES IN LESS THAN A MINUTE! Mailer`s Precancel Postmark (MPP A1) Sm. Notify me of updates to Mailer`s Precancel Postmark (MPP A) Sm.